Its not as menacing as the title would suggest. 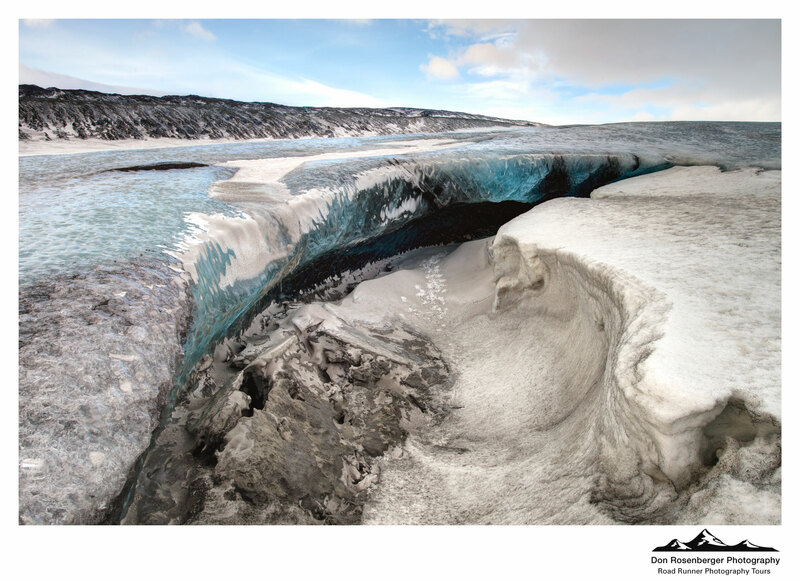 But the image above shows the entrance to this year’s ice cave under the Vatnajökull Glacier in Iceland. Getting to this location required driving over miles of frozen tundra, steams, and even a lake. It would have been impossible to find this on our own. Each year guides in Iceland start searching for Ice Caves in November. This cave is only accessible when it’s not raining. The runoff from the glacier runs through this cave and the day before it was partially flooded according to our guide. This cave was located at the base of the glacier where the ice meets a lake below. In the summer you would need a boat to get back to this spot. Three years ago the guide told us they could not find any caves. It was obviously a bad winter for the guides. The experience of being under the glacier was incredible; patterns in the ice, rocks embedded in the ice for hundreds, if not thousands of years. Iceland is incredible in the winter.